The Logitech G19 has been around for almost two years now, and yet it’s still one of the best – if not the best – gaming keyboard on the market, hands down. Sure, the newer models have some features and refinements the G19 hadn’t seen. But at a certain point the extra bells and whistles become merely “nice to have”. In fact, the G19 has a couple of features that the new Logitech G510, good as it is, lacks. Among those are the LCD panel. True, the G510 has one, but it’s built into the chassis at a pre-selected angle. The one in the G19 can swivel to whatever viewing angle is best for you. You can even use it for video playback, though at 320×240 it’s a bit rough for any meaningful viewing of, say, YouTube vids which the G19 can display. But that’s not all the LCD display has to offer. It can also show game stats and VOIP communication data. The Gamepanel software comes packed with information for dozens of different games, including World of Warcraft and Call of Duty: World at War. The software is easily uploadable and will enhance your perfomance by displaying important in game details on the LCD display. This addition to the keyboard is a great feature, ensuring that you can always keep your focus where it needs to be, on the game! The color capability extends to the backlit keys, letting you create an array of up to 16 million options, which you configure using the supplied Logitech Profile software. Is that just a “gee whiz” feature or is it really of any use? The answer will depend on the individual gamer, of course. Some will find it very handy, especially those with certain kinds of color blindness. Adjusting it to suit your specific vision can make a big difference. The G19 offers an impressive array of keys for gaming, too. While it doesn’t quite match the 18 programmable “G” keys of the new G510, a set of 12 “G” keys along the left edge is still highly useful. Combine that with its three switchable modes (like the G510) and you can create a set of 36 custom macros. With on-the-fly recording (also like the G510), those customizations can be as unique as your style of play. Sometimes what you can’t do is as important as what you can. The G19 has a ‘game mode’ switch which lets you disable the dedicated Windows key, so you never have to worry about pressing it accidentally during frenetic gaming. No accidental switch to your desktop screen here just because your fingers were flying around killing trolls . There is no way of counting the number of times this feature has saved me. Also in the area of “can’t” the G510 can’t accept USB devices because there are no ports on it. The G19, by contrast, offers two powered USB 2.0 slots. Whether you’re transferring data, loading software, or just viewing media, they’ll be useful. The G19 also brought in another Logitech innovation: the ability to recognize five simultaneous key presses. That makes for some truly expansive options. Whether you’re a gamer who uses macros freely or just someone who enjoys creating unusual digital image effects, you’ll find that feature very handy. 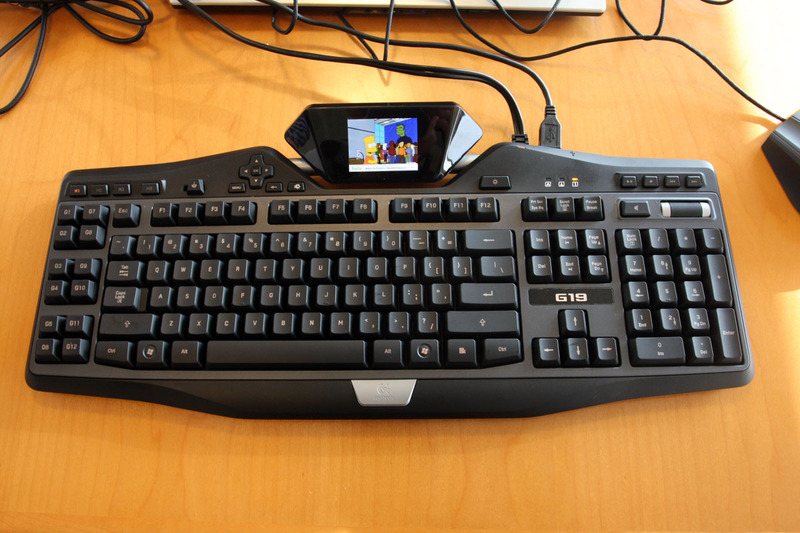 The Logitech G19 also offers built-in controls for iTunes, Windows Media Center, and other similar apps. Along with the drum-style volume control, you’ll find yourself using them often. 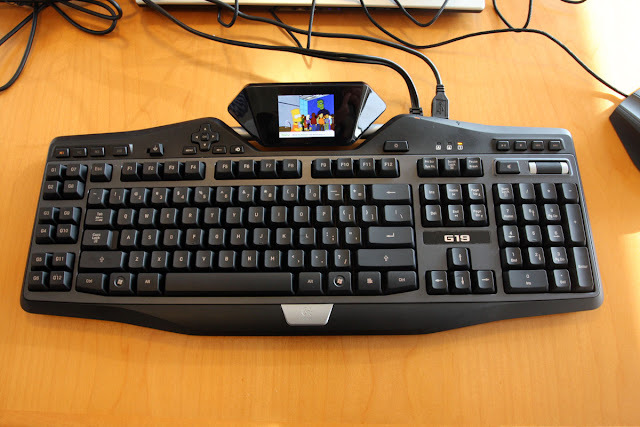 Of course, with built-in support for dozens of PC games (and apps like Ventrilo), you’ll find yourself using everything on this gaming keyboard often. With a price tag between $150 and $200 depending on where you buy, the G19 doesn’t come cheap. You will spend significantly more than let’s say the Logitech G15 or even the newer Logitech 510 which share many of the same features. In addition there is still a lack of specific applets for the G19′s full color LCD screen. Until more color specific applets are available or the price comes down I wouldn’t recommend it UNLESS you can afford the money of course. Hard plastic wrist rest. May feel uncomfortable during extended gaming.